So, if you're sick of carbs, keep reading. If you're not sick of carbs, read it anyway and tell me I'm cute and funny. And by "sick of carbs," I mean, we all love them but feel like they betray us. It's like we're Rihanna and the carbs are Chris Brown. Like, while we love them so much and the love is real and deep, we still get hit a little bit. And by hit, I mean they make us fat. Unless you're stupid and they don't affect you. If that's the case, I hate you with every fiber of my being. Not really, but kind of. Definitely. This meal is absolutely delicious and will not make you feel punished for eating healthy. Even still, I set a timer and it took less than 30 minutes to make. That's right. We have no excuses for not cooking and/or cooking healthy. AND, AND, AND!!! It cost about 10 dollars to make 4 extra large servings. BAM, Lady Lover! AND!!!!! I just realized, this is totally Paleo. Ladies, this is big. HUGE. Grill and dice your chicken breasts. If you need a marinating idea, use a little olive oil and Tony Chachere's. In a non-stick skillet, combine the onion, corn, and seasonings. Cook over medium-low heat until the onions are just barely translucent on the edges. This way, they will still be just crunchy enough. We like that. Once the corn mixture and chicken has cooled a little, combine it with the avocado and tomato and toss. 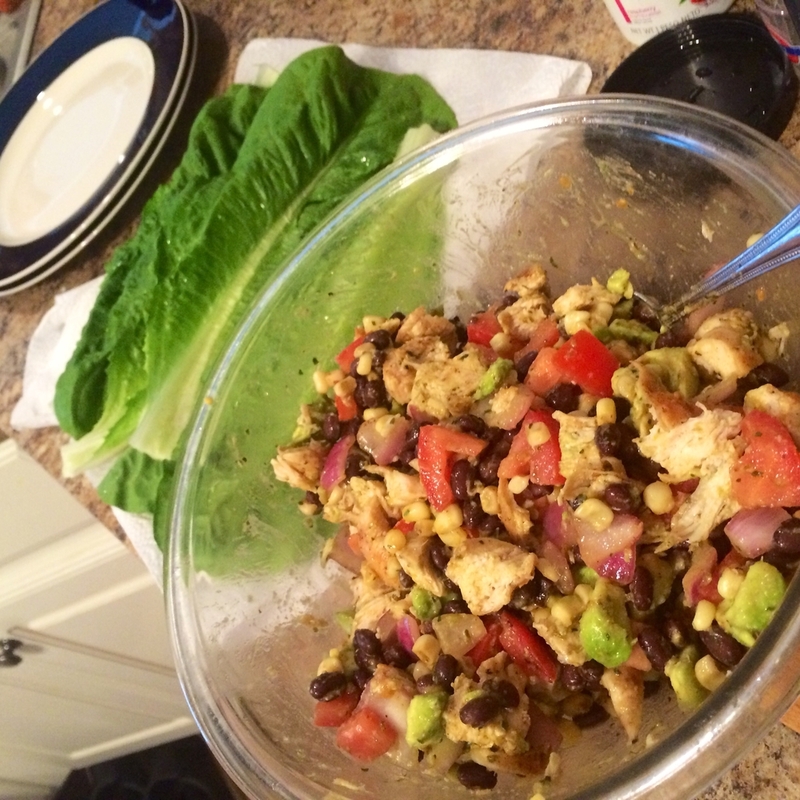 Serve over Romaine Lettuce leaves and feel yourself getting skinny! That's how it works, right? Instantaneous?